Hi, I am Sally Goldfinger, a full time Yoga teacher, Ayurveda nutritionist and Yoga therapist. I am an ultimate gelato and coffee lover too. I am committed to inspire people and to make a difference. In a time where stress and anxiety is becoming an epidemic I am dedicated to help and guide people to create a healthier and more balanced life through Yoga, healthy foods, wellness & Ayurveda and simple lifestyle routines. I do this through my Yoga Retreats, wellness events, workshops, talks, Skype consultations and sessions and food events. I live simply and believe in the little things. I enjoy my work because my work is my lifestyle. I don’t live accordingly to a strict diet routine but believe in balance. We are all different with a different body type and Ayurveda is a fantastic life philosophy which is all about balance. Ayurveda teaches us that a disease or imbalance often begins when we don’t live in harmony with ourselves, our nature and our environment. It takes into consideration what has caused an imbalance, who you are as an individual, and what body constitution you are born with. I help people step closer to creating a peaceful life with simple tools. I like to bring in the Danish”hygge philosophy” into my life and my customer’s life. “Hygge”, simply means cosy well-being. I am from Denmark myself, and over the past many years I have brought “hygge” with me wherever I go. Hygge is about winding down, simplifying situations and moments, self- care, healthy eating and healthy habits for life. It is anti-ageing, glow from within and long-term wellbeing. My purpose is to make you feel healthy, centred, fulfilled and calmer and to give you a unique experience with simple tools which you can take with you into your day to day life. I am originally from Denmark. I grew up in Copenhagen, but have lived abroad for around 11 years. I still can’t live without Danish rye bread, and always hunt for good bread no matter where I go. Yes, Sally Goldfinger is my real name. Nothing funky James-Bond-name- change here. I am born by international parents, therefore my name. English isn’t my mother tongue, so you might see a few grammar mistakes here and there, and I hope that’s okay. I speak 5 languages which often confuses my little head. However, I mainly teach and write in English. I like places with sun, fresh air and natural foods. Therefore you’ll find me in Morocco. I am based in the vibrant city, Marrakech. It is such a magical place, and a perfect place to enjoy inspiring Yoga sessions and Yoga Get-Aways. For as long as I can remember I’ve been interested in academics, food, health and writing. As a child I would always read books whilst chewing on apples and bananas. I loved school, and I truly enjoyed studying. My friends remember me as the “healthy student” because I would always bring my own lunch to Uni or have a bag full of fresh fruits and veggies next to me. Whilst chewing on carrots, I would write page after page. I always loved writing. When I was 19 years old I decided to move abroad. This was right after my high school graduation. Soon after I began my academic path, and studied in Israel and Copenhagen for 4 years, earning a B.A in Middle East Studies in Copenhagen and a M.A from Tel Aviv University. I then worked at the Military of Defence in Copenhagen. Yes, I know – a complete contrast to what I do today. 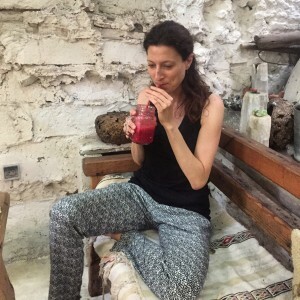 I’ve always loved to write and research, and my academic life was evolved around writing and researching about the Middle East combined with my love for food, cooking, health and well-being. About 11 years ago I decided to change career path, and I dedicated my life to the study of Ayurveda, Yoga & Holistic Wellness. I always get the same question. Why? I am not sure why the change came. There wasn’t a specific reason to my change. I guess I got tired of the 9-5 routine. I also couldn’t see the point of working in the field of the Middle East. Nothing seemed to change in that region (still the same madness today), and I knew it was time to find a new career path! Since I had an interest in holistic health and foods, and ever since I remember loved to cook and move my body, my idea about working in the health field seemed to be the right path for me. I decided to quit my job and leave the academics behind. I sold my flat in Copenhagen, sold all my furniture and belongings and dedicated myself to the studies of Ayurveda and Yoga. I spent 3.5 years in India taking a diploma in holistic nutrition from the school of Ayurveda, developing skills in tongue and pulse reading. I combined this with the studies of Hatha Yoga and Yoga Therapy. Because of my academic background, it was extremely important to me to study holistic studies in proper schools and government proved Universities. The holistic world, especially the Yoga business is often a fast 2 week course, and there is no way that anyone can go out and teach after a 2 week course. To me it’s important to teach and design Yoga classes that are suitable for the individual student, not to put pressure or force my students into uncomfortable poses in an competetative environment. YOGA – WHAT STYLE DO I TEACH? To me Yoga and Ayurveda goes hand in hand. It is two fascinating philosophies, and it is my lifestyle and what keeps me strong, healthy and balanced. This combined with Danish “hygge” is my daily life philosophy to a healthy and balanced life. I take my job very seriously. My main focus it to teach and inspire others to live healthy, balanced and happy. We all want to feel great and be in good shape. The most important thing is to balance ourselves on the inside. Yoga is not about intense handstands and uncomfortable twists. Yoga is all about feeling good and following what feels right for us and our body. This is why I teach a blend of Hatha Yoga (gentle) and Vinyasa (strength). I don’t have a fixed routine of how I teach. My classes always vary and I focus on what the individal student needs. Ayurveda is a fantastic holistic lifestyle philosophy. I offer 1-1 consultations and enjoy to inspire others and give more insight to the different body types, how to cure imbalances, how to understand what foods are healing and how we can live in balance with a holistic lifestyle – a lifestyle that’s simple and easy to follow. With the right nutrition, lifestyle and foods, we can live amazing lives. This is what I want you to experience when you join me. I want to share, inspire and make you feel at home. Did I ever regret taking a step into a new career path? Never! I love what I do, and still use my academic skills when I organise Retreats, write about health, Yoga and Ayurveda. Nothing is ever wasted. I hope to see you one day!